This is Gus, our 190 lb. 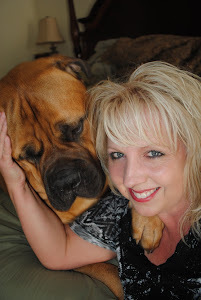 Bullmastiff...he thinks he is a lap dog. Gus is a ham and loves to pose for the camera. He actually has his own FB page where I post tons of photos of him and his kitties...yes...I said kitties and they are all feral! With the help of Gus, we are now able to pet the cats and a couple of them will even come in the house, at least for a few minutes. Check out his page if you get a chance and be sure to view the album Hanging out with my Kitty BFF's. I will be posting some of my favorite pics of Gus and his kitties in the coming weeks...so get ready to smile!!! WOW THAT DOGS A COUCH POTATO JUST LIKE ME. WHAT DO YOU FEED THAT BEAST? I BET YOUR HUSBAND HAS TO WORK A LOT OF HARD HOURS TO FEED THAT PUPPY.